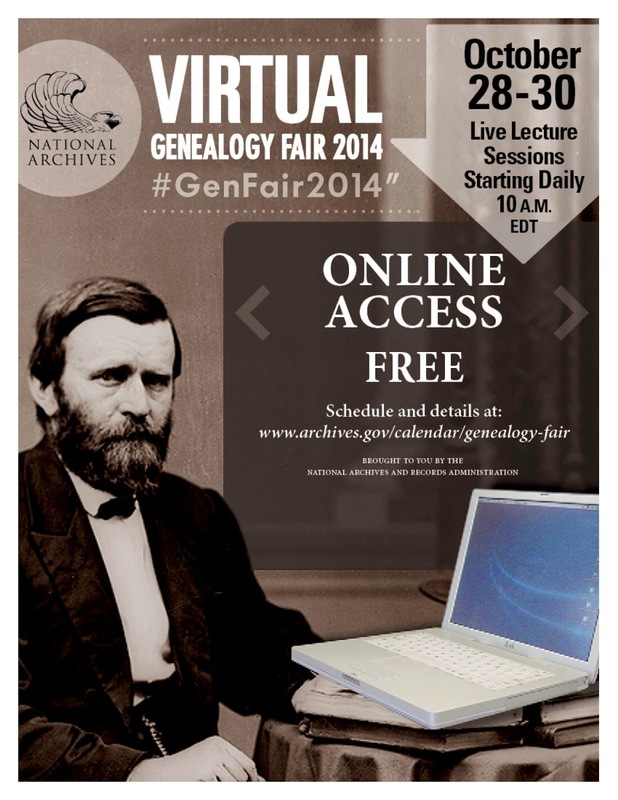 The National Archives' 2014 Virtual Genealogy Fair has just ended, and presentations will be on YouTube by the end of November. But don't despair-- the slides, along with presenter's biographies and handouts are available at http://1.usa.gov/1wL4AD4. There were 17 presentations in all, with coverage of new collections at Ancestry.com, National Archives in Atlanta, Kansas City, Maryland and St. Louis. Topics ranged widely from World War records, to doing family research with the FBI's Freedom of Information Act records (FOIA), working with Alien Case Files, using Patent Records in genealogy, to Civil War Soldiers and Homesteading. Handouts include annotated photographs of sample documents with highlighted information, for easy identification of important details, and can run to well over 20 pages. Session 2, by Mary Lynn Ritznthaler, Chief of the Conservation Laboratory at the National Archives at College Park, MD gave "Preserving Your Family Records" which engaged paper, photographs with guidelines on how to mount and preserve them using archival materials. She also noted that The American Institute for Conservation of Historic and Artistic Works offer a referral service for conservators in your geographic area. Session 11, Rick Martinez, Archive Specialist at the National Archives at Denver, Colorado, presented "Wagons West: Land Records at the National Archives." This introduction to Federal land records covers tract books, township survey plats and land entry case files along with online resources for the 30 Public Land States. Federal land records can be accessed at NARA in Washington DC and at regional archive locations. Session 15, given by Theresa Fitzgerald, Archivist at the National Archives at St. Louis, highlighted the records that detail Official Military Personnel Files (OMPFs) and civilian personnel records at the National Personnel Records Center. Session 16, by Elizabeth Burnes, Archivist at the National Archives at St. Louis presented "Friend or Foe? Documenting Alien Ancestors during Times of War", covers 19th and 20th century record sets with applications, files and lists used by a variety of Federal agencies from the Civil War to World War 2. There are over 3,000 series of records from the 18th - 21st centuries available on individuals defined as 'Aliens' (not a citizen of the US) or 'Enemy Aliens' (citizen of countries involved in conflict with the US). There's much to learn about Federal records, and these presentations are a wonderful introduction to working with a variety of sources for filling in details of your genealogy and family history. Dig in!